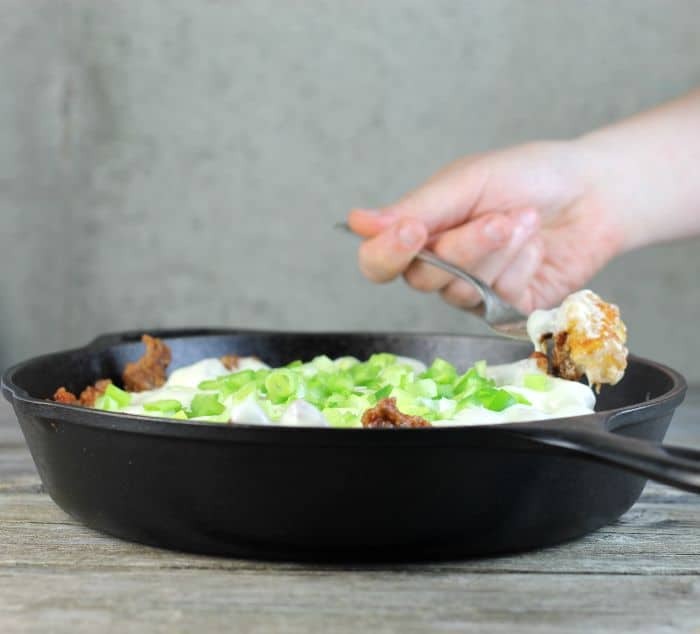 Place the tater tots in a 10-inch skillet. Make sure that there is one layer and that they fill the skillet. Bake according to the direction on the package. Brown the Italian sausage and mix with a 1/2 cup of pizza sauce. Set aside. When the tater tots are just about done baking make the cheese sauce. In a skillet melt the butter. Once the butter is melted stir in the flour. Stir until the butter and flour are well combined and smooth. Cook for about a minute. Combine the milk and cream and pour slowly into the skillet with the flour and butter combination. Cook until the mixture starts to thicken. Add the mozzarella and stir until the cheese is melted. If the cheese sauce is too thick add a little milk to thin. To assemble. Make sure the sausage is warm. Spread the sausage over the tater tots evenly. Pour the cheese sauce over the sausage and top with the green onions and green peppers.